The Earth and Stars is a very cosy, easy going and eco-friendly pub, with a huge selection of organic beers and spirits. Trés Brighton. On a Sunday however it is packed to the rafters for their roast lunch which, with plenty of other venue choices nearby, is a very good sign. There is a strict 12.30pm start to the ordering and had we not arrived early at noon on the off chance of a table we wouldn't have gotten a look in. It seems that reserving is essential here as space is limited. There are various sittings for lunch so you could be asked to move table, which is a little pet hate of mine being Italian and having the built-in need to linger after eating, but understandable as space at this pub is limited. 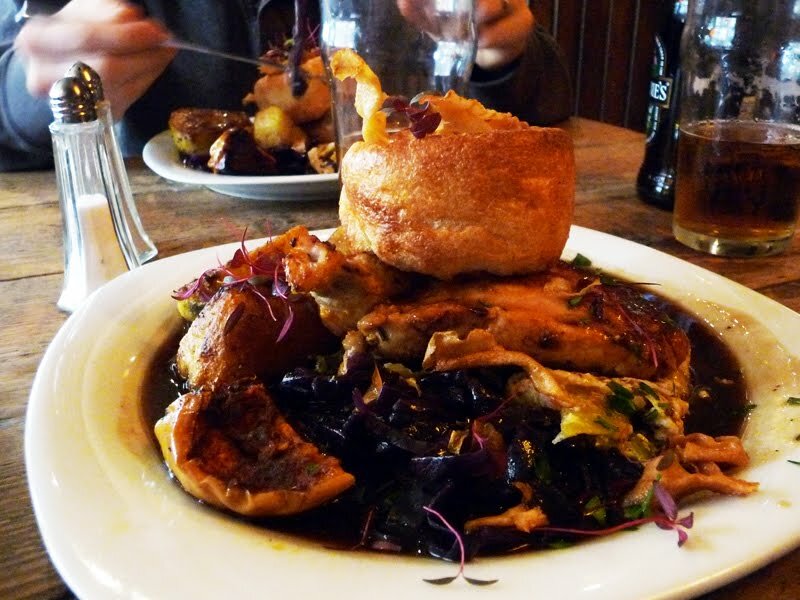 There is the general choice of roasts; chicken, beef, a slow roast lamb... but the real plus is that vegetarians are very well catered for here and even carnivores are graced with a tower of vegetables that have been cooked with love and attention. Leeks with cheese, a cajun spiced squash, peppery roast potatoes, crunchy red cabbage, peas, green cabbage and they are not tight on the gravy either. The Yorkshire pudding (sadly not homemade I suspect) was filled with parsnip crisps. The free range chicken supreme that I chose was succulent and tender, and the purple micro-leaves were a nice little touch, even if their presence was just for show. For the rest of the week the menu features eclectic Brighton pub favourites like burgers (veggie options), fish cakes, mezze platters, panini, pizzas and happy to see that the bangers for the bangers and mash are from The Brighton Sausage Company. This is a cracking, chunky tabled "Brighton" pub and with a lick of paint to the "rustic" loos and the barmaid given a spoon of happy medicine, the place would be darn near perfect.